with a strategic focus on: strengthening civil society, promoting cultural diversity, and supporting interest in both nature and the urban environment. Through the use of networks, intercultural projects, and informal learning methods OIKOS is able to make a difference in local communities. OIKOS is based in the Skåne region of Sweden, in the cities of Malmö, Lund, and Landskrona. OIKOS Community was founded in 1996 in Lund as a religious and political independent non-profit organization (NGO). In its simplest form, the term oikos has Greek roots meaning household, house, or family. Our Mission OIKOS aims to transform the labor market thus promoting the integration of groups at risk of permanent exclusion. OIKOS devotes its resources to offering a way for people to work together to create new opportunities, a new life, and a new identity. Our Projects OIKOS is dedicated to supporting a broad range of projects that are of interest to the participants. As long as the potential project is meaningful, focused with a clear direction, and that the final product can benefit the community, OIKOS will stand behind the participants’ ideas and creativity. Some of OIKOSs’ past and current projects include local television productions, exhibitions, International Puppet Theatre (Inter Dock), cultural projects in schools, workshops for bicycle recycling, and various other local services. We also offer roughly 15 internships within our various projects and activities in Lund, Malmö, Landskrona, and abroad. Diversity The various activities of OIKOS Community are built on the ethnic and social diversity that reflects today’s society. The programs are conducted in such a way to provide opportunities for everyone to enhance their own personal circumstances, regardless of gender, ethnicity, religion or belief, sexual orientation, or disability. The labor market is currently undergoing major changes and we are most likely only at the beginning of the transformation. Furthermore, the changes are occurring alongside the evolving multicultural Sweden. Increasing unemployment rates as a result of current recessions are providing for an increasingly harsh social climate. Admittedly, our focus lies primarily with social development, however we see this as the first step to affecting how we think, act, and react to the larger issues. It can be argued that the individuals most sensitive to change are those who themselves are involved in the beginning of its development. Therefore, we believe our youth today are perhaps the most strongly affected by the increasing negative trends. One of the basic problems with the current situation is that in a time of high complexity and rapid change, within the blink of an eye, solutions become outdated. As part of the new social movement, OIKOS is working to combat the shortcomings of a rigid structure that is no longer able to meet our demands and needs. As seen with similar organizations, OIKOS strives to improve the society we live in. In order to achieve this we aim to contribute to a continuous process of change. When new ideas are given a chance to replace old ones it fosters the development of more sustainable relationships between not only people, but between people, nature, and their environment. Through the development of: Education Increasing acceptance of diversity Relating local problems to global problems We strive to reach our goals and overall mission through the continuous use and development of these themes. This is done in collaboration with other organizations and people, who wholly or partially, share our values and objectives. Non-Formal Education Informal learning encompasses the lifelong process whereby individuals acquire attributes, values, and knowledge from daily experiences, educational influences, and resources in their own surroundings, e.g., family and neighbors, NGOs, libraries, and social media outlets. In today’s civil society young people are given opportunities to study and then apply the skills of managing and coordinating activities. We believe that by validating these skills, communities will learn the advantages of turning to the expertise of the younger generations. Acquiring knowledge outside of the formal education system is just as important for a student’s education as is in-class instruction. Intercultural Adult Education From the beginning OIKOS Community has used culture as a tool for social interpretation and communicative action. Within our organization we often use the term “intercultural learning” for not only the integration process, but also in a much broader context. More specifically, we use the term to describe situations where different people with unique cultures can live together in a constructive way. Interculturality can be defined as creating reciprocal relationships between individuals, groups, and cultures. Together we clarify our different identities and help to create an awareness of diversity and the opportunities to develop a good and sustainable society. Are you interested in a career or internship at OIKOS Community? From time to time we have vacancies for those interested in a civil service career at OIKOS. We can also offer other exciting projects in the environmental and cultural sectors. OIKOS Volunteering Abroad Are you interested in working or interning abroad? Become a volunteer! We offer international opportunities to work with film, music, dance, and democracy. 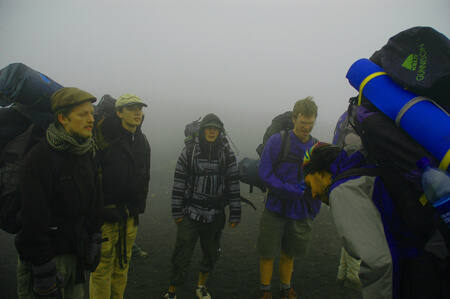 We will assist you as you explore the world as a volunteer. If you are a group of young people interested in youth exchanges with other countries, OIKOS can help. 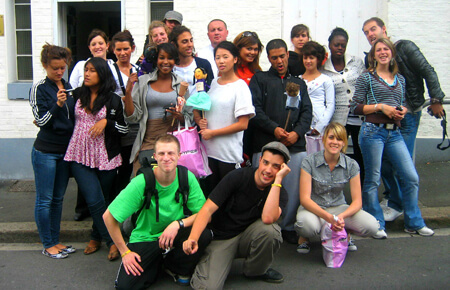 We can also assist with connecting your group with local youth initiatives with a European focus. 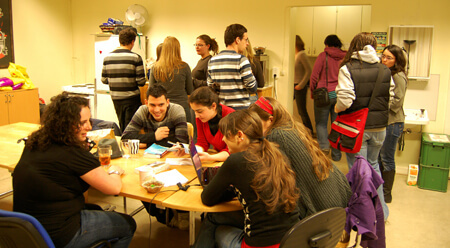 There are several opportunities for youth to participate in exchanges programs in the EU, most of which are through the program Youth in Europe. Due to our extensive and efficient network of partners within educational organizations, cultural institutions, and non-profit organizations both in and outside Sweden, OIKOS can work with you to find the perfect volunteer experience. OIKOS Volunteering in Sweden If you would like to volunteer closer to home we have opportunities in Malmö, Lund and Landskrona. You could join our youth group and dedicate a few hours a week to supporting other youth. Become a Supporting Member It is never to late to get involved at OIKOS Community. You can contact us today about getting involved in our numerous projects and activities working toward a stronger community. Internship Opportunities OIKOS regularly accepts trainees at our offices in Malmö, Lund, and Landskrona. Internships are a great way for those between 19-30 years old to learn and participate in various projects in southern Sweden. It is also possible to arrange an internship with our partners throughout Europe. Are you interested in an internship or volunteer work for Spring 2013? Send your resume and personal letter to info@oikoscommunity.org.